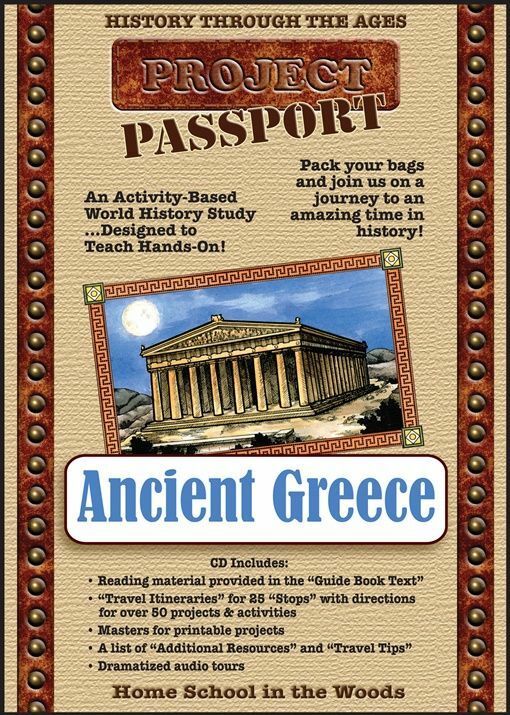 HISTORY Through the Ages Project Passport World History Study: Ancient Greece. I received Ancient Greece in a downloadable product from Home School in the Woods, but they also sell it in a CD if you prefer. It is very quick and easy to use the download and you don't have to wait to get started. As with their other Passport Studies, you begin in the first lesson by getting your passport, your binder, and your timeline all set up. There is a bit of printing in the first stop in the travel but this is just because you are laying the ground work. We took a couple days to finish all of it so not to overwhelm the kids with printing and cutting. Each stop, or lesson is separated out for clearly seeing what is required as far as printables and supplies. The Travel Itinerary section tells you exactly how to assemble the different booklets and print outs. Each stop has a Guide Book Text of approximately 3 pages to read to your students to set the time line. I so appreciate not having to know anything about Ancient Greece to be able to teach this curriculum. I learned as I read the three pages to my 12 and 15 year old. There are 25 stops, each having the Travel Itinerary and the Guide Book Text. Each stop doesn't necessarily equal one lesson. Some of the stops are bigger than others, and may require a bit more work from the student. Also there is a resource section that gives suggestions for additional books, and movies to add in. Some of the stops may invoke interest that you want to spend some more time with. On our travels we learned about the map of Greece so we could relate where the people and things were happening. I am a bit of an ink miser, so we utilize the laptop rather than printing off all of the program. With each project there is also a photo icon you can click on to make sure you assembled it correctly. This is so helpful. There are also opportunities for audio drama when you click on that icon. Each stop along the way looks at a different area of Ancient Greece. We studied the Greek Government as well as Sparta and Athens. We looked at everyday life of the Ancient Greeks. This was probably my favorite part. I love learning about how people used to live. Their clothing, foods, homes and jobs. Education was exciting to read about, as a homeschool mom. Also the start of the library, where papyrus rolls were called Byblos. There was even a lapbook to make representing that. I love books and this was a fun project to work on. Reading about Aesop's fables was another part that was fun to dive into. Stop 11 starts learning about Science and Archimedes. Medicine, and disease are included in the next stop and then the study moves on to The Arts. Philosophy and religion are touched on including Greek Myths. We weren't able to get to it in the review time, but we are looking forward to the armor and weapons section, at least my 15 year old son is. I am excited to learn more on the architecture side when we get to the Parthenon. So much to learn and study from the Ancient Greeks. Much of what they did still impacts our lives today. We aren't typically big history buffs. 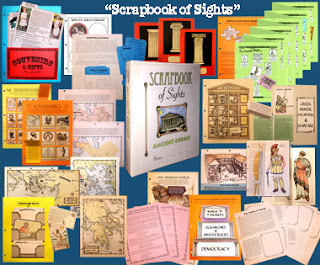 Home School in the Woods makes history come alive, and makes it fun for us to learn. I am certain we can't go back to just reading dry history books after all of this fun! Good thing Home School in the Woods has several adventures available for us. Home School in the Woods is working on Ancient Rome, due out in 2018 so be sure to pencil that in to your schedule. See what my crew mates thought of this and the other project passport adventures by clicking on the link below.